Richard Hawley • View topic - Where would you like to see Hawley play? Where would you like to see Hawley play? Post subject: Re: Where would you like to see Hawley play? we are with you. and we will be there for you. "We just loved the Minack when we went this year – it's stunning. We're not really theatre-goers but we were spellbound by it. However, the weather was piss, wind and rain slamming off the sea into your face, a bit like being hosed down with a pressure washer! And that was July. I love the sea in a gale but I don't quite know how you'd do it and not get electrocuted! If you find a way, the first three weeks of the school holidays next summer would be ideal as we are a ten minute walk round the coast in the camper. x"
Well Helen, give me pi$$ wind and rain anytime, as long as the boys are facing us and well protected and bangin out the tunes. It really is the most captivating setting and it's great to know Richard hasn't totally given up on the idea. How the heck you would decide on who gets the tickets I have no idea it would be a real bunfight - probably fewer than the Devils Arse I suspect. From memory it's about 300. Literally anywhere within the continental United States. If I had my choice though, it would be this fabulous, beautiful new hall in Pilsen. Started by a friend of friends, a guy I knew bit back in the day, who has consistently and with immense fortitude championed great music in Chicago for many years now. He's got a whole situation going there, bought and rehabbed a gorgeous place and put in delicious food and drinks, which ably fills a need for a roughly 1000 person capacity midsize hall in town. Can be set up any which way you want as a combination of seated and standing. Sounds great, looks great, super down-to-earth and friendly people. Yep, this is the place. 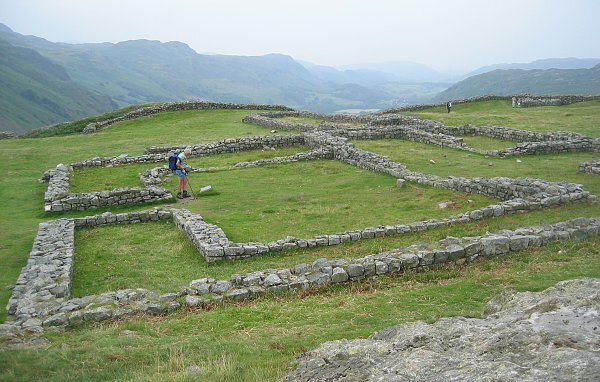 A summer solstice show at the Roman ruins, Hardknott Pass, Cumbria? Jean Oeufs Nouveaux pretentious? I think not. I would like to see Richard play somewhere in Kent as I always have to travel 100 miles or more to see the band.Back in the 70's and 80's I saw loads of bands at the university in Canterbury and the Odeon, which is now the Marlow Theatre.either of these venues would be perfect for me and I'm sure hugely popular for the people of Kent who see so few live bands these days. In Spain at May on Festival Sos4.8 in the city of Murcia. Sun , nice city and good music ( your music too Mr. Hawley please ) , we´ll wait for you . I am off to the Minack in Cornwall next Wednesday evening to watch Show of Hands. OK they are a 3-piece folk band primarily, without as much amplification and kit as Richard would need, but it will be interesting. Could it be done by Richard and the boys, electrified but with limited lighting etc ? What would the ticket prices need to be, how accessible is it really for the crew ? If it can be done in the Devils Arse, then there has to be a possibility at Minack in May/September. All things to have a think about. Minack have a series of gigs running through May before their main theatre summer season gets underway. Will take some pics and try and get them up here after. Well it's been feckin warm down here in Cornwall this week, meaning that 3 hours at the Minack was a really pleasant experience yesterday evening watching Show of Hands. I have some photos to share when I can figure out how to put them up. I had the pleasure of attending a gig in Letterkenny, Co. Donegal a few years ago. This place is just outside the town. It'd put Pink Floyd at Pompeii in the ha'penny place. But back to reality. A guy in work was at The Pixies last night in Dublin's Iveagh Gardens. It sounds like a great venue. So nice that people were reluctant to stub out their fags on the grass. Please, please, please in 2017 Richard. You'd love it there.